Hei, puolenkuun muistutus Penny Black and More haasteen aihe "Rakkautta ilmassa" eli ystävänpäivä; hää-, kihla-,tms kortteja haetaan vielä siis 28.1. asti. Tässä toinen DT korttini! Ilmassa keinuvat suloiset kissat, heinät heiluvat ja ruusut tuoksuvat, perhoset lentää... Alapaperi leimattu ja embossattu myös Penny Blackin leimasimilla, ei vaan paljon näy. Kultainen hohto on aaltopahvia ja ompelukonekin on kaivettu taas esiin. 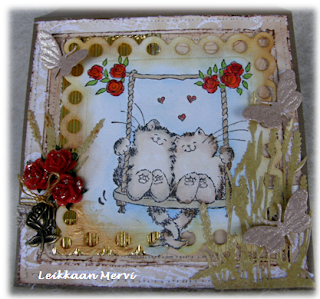 Hi, mid- month reminder about "Love is in the Air" - theme at Penny Black and More Challenge. (Background self made with) stamp: Penny Black: butterfly symphony, embossed clear, DI; stitched and distressed edges. Details with Glossy Accents. Golden corrugated paper; glittery and pearly cardstock. Oh what a gorgeous card and love the sweet image. JUst GORGeous! What a cutie this image is. Super sweet card Mervi. Darling image and design. aww, this is so cute mervi! i love the sweet image with the bright red roses and the 3D ones too. 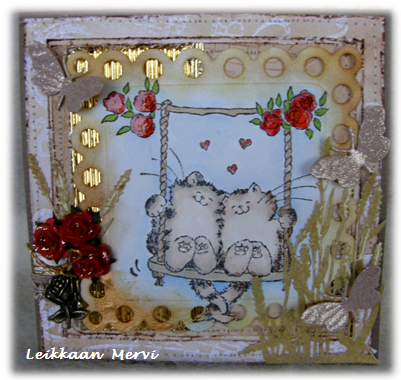 Oh, wow, such a sweet card Mervi! This image is so cute. 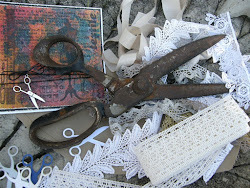 Your card is so beautifully embellished and I love the design. What a wonderful scene you created Mervi. What a lovely card and such a sweet image. Thank you for joining us at Sparkles this month. What a lovely and romantic card! Just gorgeous!! !